It’s a wrap! 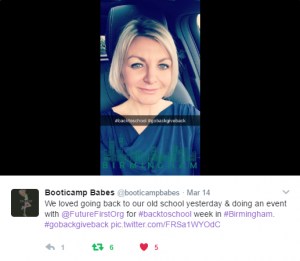 Back to School Week Birmingham 2017 is over and we are reflecting on what an inspiring week it’s been. Backed by national treasure, Julie Walters, we have been on the road showcasing the benefits alumni communities can bring to state schools in Birmingham. Click on the location points to see some snapshots of alumni events in action! An eclectic range of former students, from forensic scientists to family support workers and CEOs to undergraduates, went back to their old schools to #gobackgiveback. Every former student had a unique story to tell. At Holyhead School Abdul Sohal, who works in IT at Land Rover, explained ”my job hadn’t even been invented when I was at school.” Students heard how this former student’s success has been driven by strong communication skills and the ability to build a strong rapport with people from all walks of life. At Kings Norton Girls’ School Suzanne Swingler inspired students with her story of qualifying to become a nurse, despite being diagnosed with dyslexia after leaving school. 3 – Superstar support on Twitter. 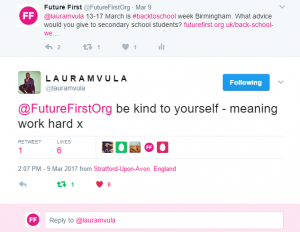 Music icon and Birmingham local Laura Mvula was one of the many people who got behind us on Twitter this week. We are honoured to have the support of this national treasure and star of social mobility themed film, Educating Rita. We consistently witness the transformative effect of introducing students to alumni role models. That’s why seeing Samantha’s story inspiring the nation is our number one highlight from the week. Kings Norton Girls’ School alumna Samantha Peckham became a mum at 16 and now sits on the Women in Transport Board. After going back to speak to students at her old school she told her story on BBC Radio West Midlands, News Now, Europe Breaking News, Pressreader.com and in local press, including The Birmingham Press! A huge thank you to all the schools, students and alumni who supported Back to School Week Birmingham 2017.